Introduction of undesired dust or dirt into or on to during manufacturing, packing and transportation is called as contamination and contaminant is the unwanted element being introduced in the system. It is any substance which has an adverse effect on the product or process. 1. Physical Contamination. Eg. Particles, fiber etc. 2. Chemical Contamination. Eg. Moisture, Vapors, Molecule, Gases etc. 3. Biological Contamination. Eg. Bacteria, Virus, Fungus etc. Unwanted introduction of one drug substance during manufacturing to the other drug substance. Example for Physical Pharmaceutical Contamination: A leakage from oil seal of the reactor may contaminate the product being processed inside the reactor. 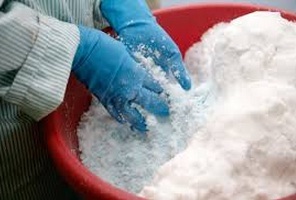 Example for Chemical Pharmaceutical Contamination: In case the recovered solvent is stored in a drum of other solvents, which was not cleaned properly may contaminate the recovered solvent. The contaminated solvent if used in the process may spoil the product by giving the additional impurity. In case a product is exposed in an uncontrolled environment of high relative humidity, may increase the moisture content of the product. Example for Biological Pharmaceutical Contamination: If powder processing equipment is left undried after cleaning with water may proliferate the microbes in the equipment. If the same contaminated equipment used for processing may contaminate the powder microbiologically. Use of biologically contaminated water for cleaning of equipment. Controlling the use of equipment for a different product. Controlling the use of air. Controlling the use of water. Proper gowning in the clean area where the product is exposed for a longer time. Water is commonly used pharmaceutical ingredient and one of the biggest sources of cross-contamination. Sampling in a segregated cubicle/booth fitted with suitable air control systems. Dispensing stations must be equipped with suitable dust extraction system. All containers packaged must be effectively cleaned before these are admitted to the storage area. Regularly check and confirm the integrity of oil seals. Air supply systems for the production and dispensing areas must be designed to avoid contamination into the airflow (or) to the manufacturing areas. Do not return the samples drawn for in-process control to original containers. To the extent possible, material during the process should be unidirectional. Regularly monitor the quality of water, particularly for microbial contamination. Simultaneous charging of raw materials for two different batches, two different stages and two different products should be avoided. Simultaneous unloading of materials for two different batches, two different stages and two different products should be avoided. Line clearance must be taken for the product change over. During the change over single individual impurity is not more than 0.1% (1000 PPM). Total impurity is not more than 0.5% (5000 PPM).